We’d love your help. Let us know what’s wrong with this preview of Bless This Mess by Jennifer Keating Moore. They're cute. They're fun. And they're powerful! 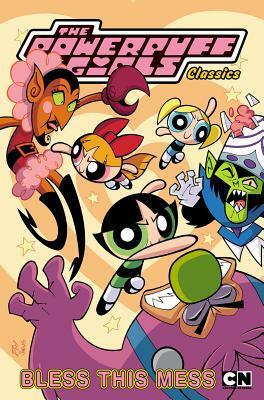 The Cartoon Network classic Powerpuff Girls return to comics in this collection of comic-book adventures. This fourth volume features issues #17-22 of the DC Comics series. To ask other readers questions about Bless This Mess, please sign up. I grew up with the Powerpuff Girls, I had PPG everything. So I naturally had to read this. The stories made me smile and I really loved the coloring on them. Just as vivid as the cartoon. BLAME IT ON THE BOOGIE! Still like reading the DC reprints. I keep saying this, but it like watching lost episodes. I even pu the voices in my head and have the them going too.